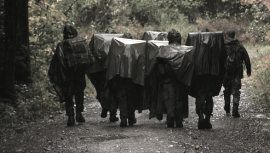 The Survival, Evasion, Resistance and Escape (SERE) course held at the Navy’s remote training site in the mountains of Maine and in the desert of Southern California are courses that helps Navy pilots / aircrewmen, as well as other ground troops in the Navy (SEALs, SWCC, EOD, RECON / MarSOCC , and Navy Combat Medics) learn about evading capture as well as being held captive by an enemy force. Article I - I am an American, fighting in the forces which guard my country and our way of life. I am prepared to give my life in their defense. Article II - I will never surrender of my own free will. If in command, I will never surrender the members of my command while they still have the means to resist. Article III - If I am captured I will continue to resist by all means available. I will make every effort to escape and to aid others to escape. I will accept neither parole nor special favors from the enemy. Article IV - If I become a prisoner of war, I will keep faith with my fellow prisoners. I will give no information or take part in any action which might be harmful to my comrades. If I am senior, I will take command. If not, I will obey the lawful orders of those appointed over me and will back them up in every way. Article V - When questioned, should I become a prisoner of war, I am required to give name, rank, service number, and date of birth. I will evade answering further questions to the utmost of my ability. I will make no oral or written statements disloyal to my country and its allies or harmful to their cause. Article VI - I will never forget that I am an American, fighting for freedom, responsible for my actions, and dedicated to the principles which made my country free. I will trust in my God and in the United States of America. The instruction begins with a week of classroom work focusing on wilderness survival and the real world applications of the code of conduct for a service member. This includes an extensive look into ways of surviving off the land, navigating by compass, and finding a safe location to hide and live. Survival - Survival training starts in the classroom for the first week. Then it is tested out in the field, living off the land, building fires, catching and gathering food, finding water, all while evading the enemy. Evasion - The students will tasked with a situation to travel from one safe house to another. Throughout that day and night, instructors with thick Arabic accents (formerly Russian accents) search the areas in between the houses patrolling the easy routes between areas. Resistance - At some point, you will get caught or have to turn yourself into the instructors to start the resistance phase. Here, you are a captured prisoner of war. Treated like a prisoner, in a cell, and getting beat and interrogated like a prisoner. While captured, your goal is not to give up any information during interrogations and not be used as propaganda by the enemy. Escape - When possible, make all efforts to escape your prison cell and the camp. It is difficult to do and you will get caught and beat again, but the planning of the escape will give your mind something to do while the enemy plays horrible music, children crying, and repetitive, mind-numbing recordings on loud speaking making it difficult to sleep for very long periods. The students never forget the simulations and lessons that are taught and the confidence gained may save a life in certain situations. The students will gain the technical knowledge, practical experience and personal confidence necessary for worldwide survival and evasion, although no two students are the same and sometimes individuals find themselves out of their element. One thing the students learn is that they are tougher than they once thought and that it’s only human nature to do all that is necessary to stay alive. The training that takes place in the remote areas of SERE training opens the window into how to survive when things go from bad to worse. The instructors at SERE have combined years of knowledge and experience directly from surviving POWs making this course an invaluable tool for all those that could possibly be in danger of capture by enemy forces. In the end, a result of the course is a stronger and more devoted American military member with knowledge that will save their life in just about any situation behind enemy lines that a lone American can experience. What's Basic Enlisted Submarine School Like? What Are Some Common Air Force Technical School Training Restrictions?